The FitzOsbournes is Book Two of the Montmaray Journals. It follows the life of Sophie FitzOsbourne and her ruling family of their island home. Sophie has escaped to England and is being looked after by her strict aunt Charlotte. Montmaray has been invaded and Sophie’s determined to go back and reclaim her rightful home. However, the glamour of high society clashes with her mission and she becomes preoccupied with the city life. Sophie and her sister Veronica are making their debuts. They use their opportunities to raise a voice of concern for Montmaray but it’s a dangerous time for politics when Europe is on the brink of another world war. There are so many wonderful aspects to this historical novel. Montmaray may be fictitious but because it’s placed in the real world, you’ll get a real sense for the society in the late 1930s. Cooper has done a tremendous job in her research and it all feels authentic. The FitzOsbournes are defiant in this classy world, with each member making an impact in the English society. Readers will be entertained with Veronica’s antics when she ruffles up some feathers at various parties. There’s also lots of humour through Sophie’s witty entries and her family’s constant rebellion. There’s also a personal insight into someone who’s not only lost their home, but also their sense of belonging. 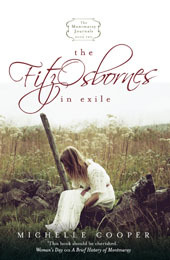 The FitzOsbournes in Exile is an enjoyable novel that will win new fans and keep the old ones hanging for the final book in the trilogy. It’s recommended for ages 13 and up.